Today, the Roach Valley Way follows some of the sea walls along the riversides in our district. The peaceful rivers Crouch and Roach with their many tidal creeks provide leisure facilities in the form of walking, cycling and sailing. However, a hundred years ago the distinctive red sails of sailing barges would have been a common sight on the much wider surfaces of our tidal waterways, even visible from far across the flat fields. These barges were the HGVs of their day. These barges were the HGVs of their day. Being shallow drafted, they were ideal for work on the narrow creeks and estuaries and around our District's islands, even when laden drawing only four feet (125cm). Yet they could carry huge loads and were a vital part of the economy at a time when the urban population was increasing rapidly. Subsistence farming was no longer viable and people and horses working far from the countryside had to be housed and fed. 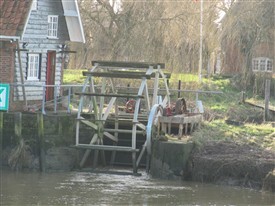 Sailing barges on the rivers of the Rochford district were a vital link in the supply chain. The few roads which existed were often flooded. Carts were slow and each one only carried a small load. Sailing barges were ideal bulk carriers and, indeed, their use continued on the East Coast longer than anywhere else in north-western Europe. 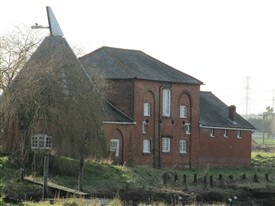 Every riverside farm or mill here had its quay, jetty or hard. The remnants can still be seen at Lion Wharf, Wallasey, Paglesham, Hullbridge, Rawreth and many other places along the riversides. (Several are shown on Ordnance Survey map number 176.) 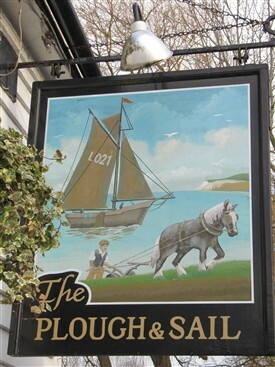 The river trade is also commemorated in the names of public houses: Plough and Sail, Anchor and Barge. 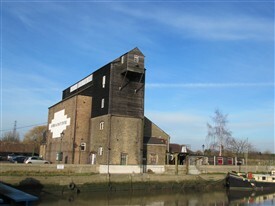 Some land and mill owners, such as Rankins and Meesons, owned the barges used in connection with their trades. Corn from farms to mills and milled flour back downriver again; bricks, from the brick fields; timber imported from Scandinavia then freighted onwards and upriver by barge from larger ports; cement from the Thameside works all these and other cargoes were regularly transported by water right up to the Second World War and even longer in some trades, until the sailing barges were forced to give way to bigger, faster, motorised barges and lorries. An interesting and extraordinary sight must have been the “stackies”. These were sailing barges specially adapted to carry huge stacks of hay or straw on their decks and even overhanging the sides. This was taken from farms in the Rochford area up the London river to help feed and bed the thousands of horses which worked on the streets of London well into the middle of the last century. 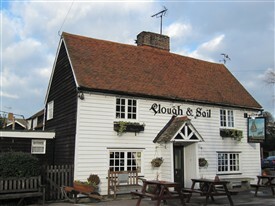 The return cargo, and there was always a return cargo if possible, would often be of “London muck”: rubbish, manure and road sweepings which would be used to fertilise the Essex fields. It was a hard and dangerous life sailing round the treacherous sands of the Thames estuary. The Whitaker buoy at the mouth of the river Crouch marked the safe channel but sailing barge skippers with their local knowledge often took a short cut over the Maplin sands, sometimes misjudging the depth of water and finding themselves aground, thus having to waste valuable time until the next tide would float them again. Time was money in this trade, particularly as crews were paid on a share basis and the sooner another cargo could be loaded and got away the better. All this labour and industry has gone now but there may be people who remember some of this important part of past rural life. Please do contact us if you have any information, memories or photographs which will help to fill in the gaps in our story. This page was added by Sue Horncastle on 08/02/2011.